The Human Angiopoietin-Like 3 ELISA Kit contains the components necessary for quantitative determination of natural or recombinant Human Angiopoietin-Like 3 concentrations within any experimental sample including cell lysates, serum and plasma. 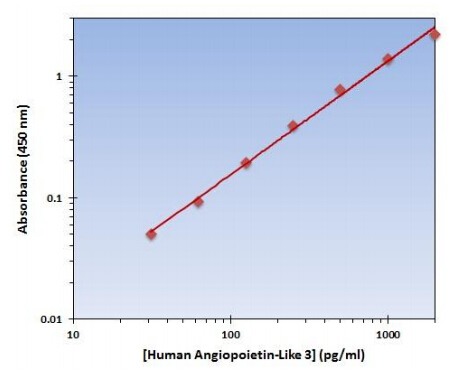 The Human Angiopoietin-Like 3 ELISA Kit allows for the detection and quantification of endogenous levels of natural and/or recombinant Human Angiopoietin-Like 3 proteins within the range of 32-2000 pg/mL. Have you cited DIA-XYA132 in a publication? Let us know and earn a reward for your research.